There are poses and moves that I love to do that I don’t get to do in my classes. Some of the poses or moves require a wall. While there are walls in the venues where I teach, they are not always accessible. Some walls have mirrors and most venues ask people to NOT TOUCH the mirrors. Some walls have chalkboard, white boards, cork boards, and other types of boards where announcements are hung. It is not feasible to use the walls with the boards, because we would be touching and possibly damaging the announcements. And some walls have cabinets and sinks, so that doesn’t work. Some walls aren’t really WALLS at all, but they are windows, that is almost the same as mirrors in that we shouldn’t be pushing on them and putting our hand prints all over them. And for some poses it wouldn’t just be hand prints — it just wouldn’t work. Some walls have ballet barres attached to them so they wouldn’t work for the poses or movements. And some walls just have too much stuff in front of them to be used. So in the majority of the classes I teach we don’t use the walls, which is a bummer. One pose that I have been doing a lot lately on my own is a great one, but it requires a wall. The name is actually “Legs up the Wall Pose” or the relaxed version of Viparita Karani. Basically for this pose you lie down on your back with your buttocks up against the wall and your legs straight up on the wall. The benefits of this pose touted by practitioners of yoga are many. Including calming the mind, easing anxiety and stress, relieving tired feet and tired lower legs. I find that I am comfortable in this position for about 15 minutes. If I am going to stay in this position longer than 15 minutes I like to lie on something, like a folded towel. I place the folded towel under the lowest part of my back. This is a relaxing position and should feel very comfortable, so adjust your body in order for it to be comfortable for you. That could mean moving your body away from the wall, so your buttocks are not touching it. Move as far away as you need to in order to relax and still be in the pose. Or it could mean using a bolster under your buttocks and lower back or a towel under your lower buttocks. Move and adjust yourself and any prop you are using to find something relaxing and comfortable for you. You may even want to put a rolled towel or something under the arch of your neck for support. Stay in this position as long as you are comfortable. Be aware of your feet and any sensation you may have. I usually roll out of the pose when my feet get tingly. In some styles of yoga Viparita Karani is done with the legs in the air and a support device or your hands supporting your lower back with elbows bent. This version gives you the benefit of the legs being higher than your heart, but it is not as relaxing and restful as with your legs against the wall. If you are in good health and cleared to do yoga and inversions, I would recommend this pose. It is great for relaxation. I have been doing it before I go to bed. Are you familiar with this pose? Have you ever tried this pose? This entry was posted on May 14, 2015 at 4:50 pm	and is filed under Yoga/PiYo/Pilates. 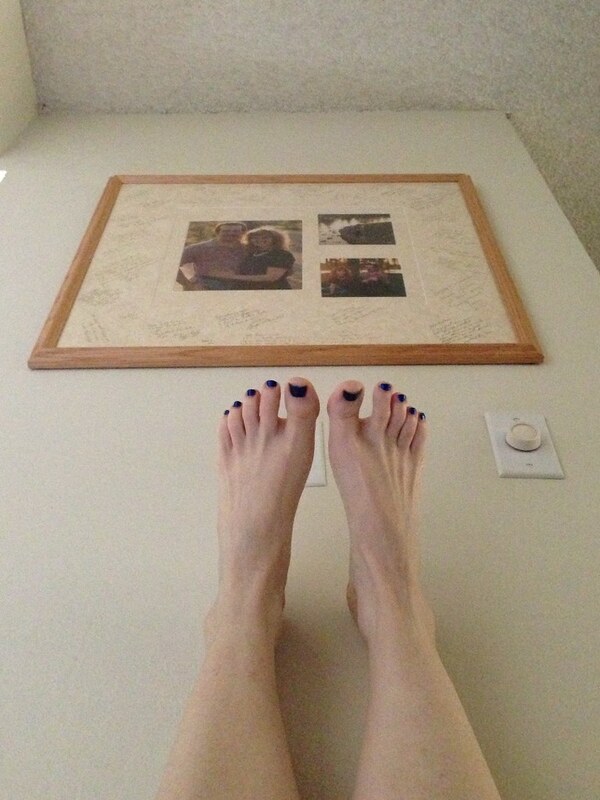 Tagged: Legs up the Wall Pose, relaxing pose, San Jose Group X, stress relieving pose, Viparita Karani, yoga classes, Yoga Practice. You can follow any responses to this entry through the RSS 2.0 feed. You can leave a response, or trackback from your own site.